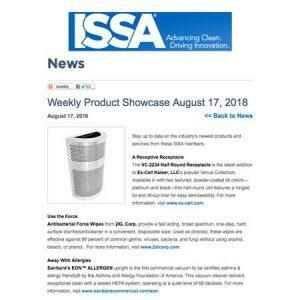 Great mention of the Sanitaire’s EON Allergen in the ISSA Weekly Product Showcase August 17, 2018. The ISSA is the leading trade association for the cleaning industry worldwide. the Sanitaire EON ALLERGEN Upright Vacuum Cleaner has passed our strict scientific standards to be Certified asthma & allergy friendly®.